Oil baronness Lily Harkness isn’t so much steel magnolia as titanium cactus. She’s used to living in a man’s world and when she plays, she plays to win. She wants exclusive oil rights to ensure her company remains at the top and she’s not walking away empty handed. Sheikh Isma’il al Zahara rules his country his way. Always in command, he has his own plans for his country’s oil and it’s not just about the money. But he’s intrigued by the buttoned up business woman who’s come to his country to strike a deal. He can’t help but wonder what’s beneath her icy facade. Lily’s desires are buried down deep, but her attraction to Isma’il is too strong to deny. Will seducing the sheikh cost Lily her body and her soul? Outside the tinted windows of the limo, the sun had turned the tarmac of the private airstrip into a molten silver river, glinting off the sleek Lear jet that had only just touched down. Mid-morning in Dahar and already the heat was intense. Sheikh Isma’il ibn Khalid al Zahar stared at the aircraft, trying to concentrate on the meeting ahead and not the thick musty scent that still seemed to fill his nostrils. Or the tainted feeling that had crept right into the very marrow of his bones. Returning to Dahar and all the memories that lurked in the corridors of the palace had been bad enough, but spending all morning in his father’s office, going through his papers, had been worse. Yet Isma’il couldn’t put aside what needed to be done, purely because of some personal distaste. A month had passed already since the old man’s death and Isma’il’s investiture as sheikh, and the task of rebuilding Dahar couldn’t wait. A strange feeling lingered on his fingertips. Turning his hands palm up into the sun, for a second, he thought he saw something. A red stain. Blood maybe? He frowned, but when he looked again, there was nothing there. Still frowning, Isma’il brushed his hands off with a careful, fastidious movement, wiping the strange feeling away. Out on the tarmac, his personal bodyguards had arranged themselves to form a corridor between the limo and the jet. One, held a brightly colored silk parasol in his hand. A courtesy for his guest. Isma’il stared at the bright splash of color and in the dark glass of the limo window saw his reflection. Saw the smile on his face. It looked almost savage. Too savage. Definitely, he’d been spending far too much time in his father’s office. He was here to greet a potential buyer for Dahar’s oil, not an enemy he intended fight. With the ease of long practice, he adjusted his expression, making sure nothing remained but the cool, easy charm that was by now effortless to him. Then, he opened the limo door and stepped out into the blinding heat of the airstrip. His bodyguards snapped to attention, his chief advisor Umar coming immediately to his side. The jet’s doorway, however, remained empty. “Where is she?” Isma’il was not accustomed to waiting for people and he found he didn’t much like it. “I’ll check, your Highness,” Umar assured him, starting towards the plane. The man was halfway there, when abruptly a tall figure exited the aircraft. A woman. The woman. Lily Harkness, CEO of Harkness Oil and Petroleum. There had been many companies frantic for the rights to Dahar’s lucrative oil reserves and Isma’il had gradually narrowed the field down to three possibilities. He’d already met with the CEOs of two of those possibilities. Harkness Oil was the third. It had been the lead contender, at least until Philip Harkness had retired as CEO and his daughter had taken over. His young, unproven and no doubt inexperienced daughter. An appointment that had nepotism written all over it. Isma’il leaned back against the hot metal of the car and folded his arms, taking her in. He’d been expecting a Daddy’s girl, a pretty little princess stepping into the shoes her father had lovingly prepared for her. But the woman currently descending the metal stairs from the jet’s door to the tarmac below did not look like any princess he’d ever seen. Oh, she was blonde, her features precise and lovely. But no princess was ever, surely, that tall. At least six foot. And certainly they didn’t wear blue pant suits that appeared to be tailored to hide every feminine curve. Nor did they stride around on the tarmac in a masculine fashion with a phone glued to their ear, while various flunkeys fluttered around them like butterflies. Oh no. Princes did that. Not princesses. Isma’il found himself unwillingly intrigued. She was unexpected, he’d give her that. Especially when, she hadn’t even looked his way. Not once. And when was the last time anyone had ignored him so completely? He couldn’t remember. It was difficult, after all, to remain unnoticed when you were six foot five and a sheikh. Pushing away from the limo, he straightened, standing at his full height. The bodyguards, several of whom were slightly less at attention than they should have been, instantly did the same. Ms. Lily Harkness didn’t seem to notice. She was still barking into her phone like a share trader on a Wall Street trading floor. The hot sun had turned her pale blonde hair, worn in a no-nonsense chignon, almost silver, while her light golden skin had begun to flush in the heat. Isma’il gestured to the bodyguard with the parasol. She may not have been a princess, but it had been his experience that women did not like to sweat. As the man stepped forward, Lily disconnected the call with a precise stab of her finger. She gestured to the flunkeys, who promptly went back up the stairs and into the jet. Then, and only then, did she finally deign to turn in his direction. Eyes the color of dark, bittersweet chocolate looked into his and he experienced the oddest sensation. Like a whisper of static across his skin, raising the hairs on the back of his neck. Blonde brows—unusual combined with dark eyes—quirked a little in response, but she didn’t look away. Interesting. Most of the time, women blushed and either averted their gaze or regarded him with blatant sexual interest when he looked at them. Lily Harkness did none of the above. Instead, she looked at him up and down like a general surveying an approaching army for weaknesses. An instinct within him, one that had been long buried, went quiet and still in response—the hunter spotting new and challenging prey. She frowned, as if she too had felt something, but didn’t quite know what to make of it. Then, with the merest shrug of her shoulders, she put the phone in her pocket, and strode towards him, leaving the bodyguard trailing in her wake still trying to get the parasol up. He did business with many westerners, but none of them strolled up to him and introduced themselves with a handshake. Still fewer, when it was a woman doing the handshaking. And that voice. Coolly confident with a sensual, husky edge. It made him think of things not entirely appropriate for business meetings. She hoped he didn’t have to wait too long in this heat? He raised a hand. The bodyguard with the parasol approached along the tarmac. “For me?” She frowned in puzzlement, as if the idea that she might need shade was utterly alien to her. At least, she wasn’t like the ladies he knew. The demure, quiet ladies of his court, the soft, feminine curvaceous ones he liked in his bed. No, most definitely not. Ah, westerners. They were all the same. All impatient. All wanted to head into business immediately without giving proper respect to the hospitality of the host. Dahar was far more westernized than it used to be, but they did have their traditions. He’d thought Lily Harkness would be more aware of this, especially considering one of Harkness Oil’s major selling points was their sensitivity to local customs. Perhaps this was an example of her inexperience? If that was the case, then she would need to learn how things were done here. So cool. As if even the fierce sun’s heat couldn’t touch her. A heat she clearly must be feeling given the deep flush in her golden skin and the obvious sweat on her brow and upper lip. The hunter’s instinct stirred again, wanting to test her in some way. She frowned. Raising a hand, she absently undid the very top button on her shirt, the drop of sweat sliding further to pool in the hollow of her throat. An unexpected and extremely unwelcome pulse of physical desire went through him. Hardly appropriate. This was business and important business at that. The issue of Dahar’s oil rights would set the stage for his future rule and getting side tracked by animal lust was not the kind of stage he wanted to set. Quelling the inconvenient desire, he gestured to the bodyguard standing behind her, who obediently raised the parasol over her head. He had to hold it up quite a way. So very cool. So very self-possessed. A natural kind of authority radiating from her that he found both confronting and oddly exciting. It wasn’t what he’d been expecting. She wasn’t what he’d been expecting. Maybe Harkness Oil wasn’t to be dismissed from the running after all. “I think you will find that sunstroke in the desert is not at all like sunstroke in Sydney.” He gestured to another bodyguard who stepped up, hand outstretched to carry her briefcase for her. Her gaze switched to the bodyguard, a faintly hostile look on her face, her hand staying very firmly on the handle. “Thank you, but I prefer to keep my briefcase with me if you don’t mind.” Her tone was cool, but he heard the edge of command in it. Such intriguing behaviour. He’d never encountered a woman who measured him up like an opponent. Like a man measures another man he’s about to fight. It was exhilarating, a breath of fresh air after the suffocating hours spent in his father’s study. In his father’s head. Maybe Lily Harkness had more potential than he’d first thought, despite her inexperience. It was certainly going to be interesting getting it out of her. Her brown eyes narrowed as if she found the gesture in some way suspicious. She held his gaze for one long second and he did not miss the flare of unmistakable challenge lighting the darkness of her eyes. And the hunter inside him woke up completely. Riveted. Lily slid into the blissful cool of the limousine trying to understand just why the sheikh of Dahar was putting her off her game so badly. He’d proved to be difficult in a variety of unexpected ways. The parasol. The bag carrying. Opening the car door. All very old fashioned and courteous, and probably just the kind of thing some women loved. But she didn’t. Such displays undermined her position, a position that had been weak to start out with. Would the sheikh have carried the bags, shaded with parasols and opened the doors for the male CEOs of the other oil companies? She was thinking no, he probably hadn’t. Annoyed by her own reactions, Lily began straightening her jacket and smoothing the fabric of her trousers, neatening herself up again. Making sure her armor was securely in place. Then, she realized she’d undone the top button of her shirt. A surge of irritation went through her as she remembered that little power play with the parasol. Because it had been a power play—of that she’d had no doubt. She hadn’t spent ten years in the oil business without recognizing when someone was testing her. A test she couldn’t help thinking she’d failed in some way. Frowning, she made sure the button was firmly closed as Isma’il slid into the seat beside her, closing the door on the furnace of the airstrip outside. Feeling more in control now she was neater—though nothing but a shower was going to get rid of the horrible sweaty feeling—she let her gaze run over him, trying to pinpoint the source of her discomfort. Tall. Much taller than she was and she almost never encountered men who were taller than she was. So tall in fact, that his closely cropped black hair brushed the roof of the limo. And big. Powerful. One might expect a man of such height and power to be awkward or stiff and yet he sat beside her with all the loose-limbed grace of a hunting cat. In his dark suit, perfectly cut as befitting his station, there was something almost dangerous about him. A strange thought. Men weren’t dangerous. Because for them to be dangerous, she would have to be vulnerable. And she wasn’t vulnerable. Not ever. Lily glanced up at his face. Handsome seemed too bland a word. Strongly defined with high, sharp cheekbones, his features were fierce, arrogant. A harsh beauty to him that she found compelling. She frowned. Since when had she noticed a man’s looks? Normally masculine beauty had no impact on her at all, so why was she now noticing this sheikh’s? There was just something about him. Something she couldn’t quite determine . . .
One corner of his mouth turned up in that smile she refused to call charming. Then he took off the sunglasses he’d been wearing and Lily’s train of thought came to a crashing halt. His eyes were the color of a tropical sea. A perfect, clear, turquoise. With his bronze skin and thick, black lashes, they elevated him from compelling to unforgettable. One perfect black brow lifted. “Something the matter?” His voice was deep, lazy and edged with an accent that made her feel . . . odd. Ah yes, despite that erroneous accusation that she hadn’t done her research, Lily knew quite a bit about his Highness Sheikh Isma’il ibn Khalid al Zahar, and his late mother’s Bedouin ancestry was the least of it. He’d invited Harkness to Dahar before her father had retired, but she’d read all the info. She knew about the turmoil following the old sheikh’s death. Knew the rumors about Sheikh Khalid’s tyranny. Knew his son had spent the last twenty years away from his country before returning to take up the mantle of power. Knew that the sale of the oil rights was a contentious issue and an important one for a new ruler to make. Especially a ruler who perhaps wanted to distance himself from his father’s violent reign. That knowledge was a chip to bargain with. Because he wasn’t the only one who needed to prove himself in his role. She did too. “Is this an appropriate time and place, your Highness?” she asked coolly, meeting those incredible eyes head on, trying to ignore the sense of discomfort that seemed to increase as he looked at her. He smiled at her again, his teeth white in his dark face and she found herself noticing the shape of his mouth. Long and . . . sensual. The limo had pulled away from the airstrip and onto the road, the heat of the sun turning the world outside hazy. Lily glanced out the window at said view. A dry, brown plain stretched out on either side of the road, rough stone housing at intervals. Goats nibbling at rare leaves of grass. Dirty children playing in the dust. Small talk. She’d never been very good at small talk. It had always seemed like a waste of time, especially when there were deals to be made. But if he wanted small talk, she’d give it to him. A reprimand. Lily had to grit her teeth against the hot surge of anger that accompanied it. Anger at herself. She’d read the research, she knew that business in Dahar was conducted differently. But there was something about this man that put her off balance in a way she wasn’t used to. The words didn’t surprise her. She’d heard them all before in the course of her oil career and even before that, when she’d been a competitive swimmer. Once, she’d let words like that cow her. Never again. His smile widened, becoming a little darker. A little sharper. A little more dangerous. Reminding her that this man was the son of a brutal king. Perhaps it was then that Lily began to realize she wasn’t dealing with just another difficult man. Another arrogant CEO. Oh no. She was dealing with a sheikh. 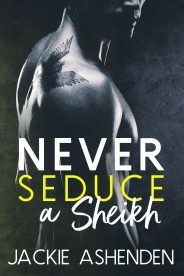 Did you know that Never Seduce a Sheikh and many titles are available digitally from Tule's own bookstore? Check it out!